“This is my signature salad, featured at my Dish D’Lish Cafes. It includes yummy roasted pears—the perfect foil to the blue cheese and tangy cranberry vinaigrette,” says featured Pear Panache chef Kathy Casey. To roast the pears, preheat an oven to 500 degrees. Cut the pears into eighths lengthwise. Core, then cut crosswise into 1-inch pieces. 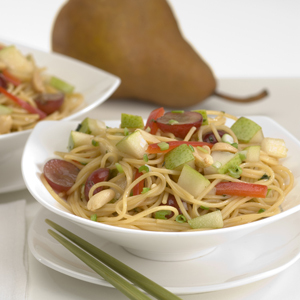 Whisk the remaining ingredients in a large bowl, then gently toss the pears in the mixture. Spread the pears on a rimmed baking sheet lightly sprayed with vegetable oil cooking spray and roast for 7 to 10 minutes, or until lightly caramelized. You can make the pears up to one day in advance. If you do, cool them thoroughly before refrigerating, then bring to room temperature about an hour before serving. To finish the salad, cut the root end and about 1 inch of the top off the frisée. Rinse the frisée thoroughly, separate the head into leaves, and spin dry. Cut the stem ends off the endive, halve the heads lengthwise, then cut lengthwise into thin strips. Toss the frisée and endive in a large, deep bowl with the remaining greens and about ½ cup of the vinaigrette. Chef’s Note: If you are having a big dinner party during the holidays, the entire recipe can easily be doubled. 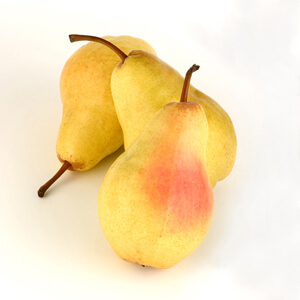 And, if you are tight on time, you can substitute sliced fresh pears for the roasted pears.